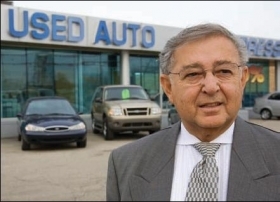 DETROIT -- Tarik Daoud, the longtime CEO of the former Al Long Ford in Warren, Mich., died Sunday. He was 78. Daoud moved to the U.S. from Iraq in 1956 and graduated from Lawrence Tech University with an engineering degree. When he couldn't find work as an engineer, Daoud began selling cars in 1963 and purchased Al Long Ford in 1971 after owner Al Long passed away. Long was the father of Daoud's wife, Helen. The dealership closed in 2008. In 1999, Daoud was honored as an American Dreamer by Crain's Detroit Business. In 2006, he was ranked No. 2 on the Crain's Most Connected People list. Visitation will take place 2-9 p.m. today at Southfield Funeral Home. A mass will take place at noon Wednesday at Basilica of St. Mary Church, 18100 Merriman Road in Livonia; a committal service will follow at Acacia Park Cemetery in Beverly Hills, Mich.